Located in Marin County California, Visit Tanzania Tours & Safaris specializes in tailor made safaris that fit all kinds of budgets including safaris for Mountain Climbing, Cultural Tours, Day Tours and Beach Holidays. Our mission is to offer a safe, well organized, fun and educational experience to all our travelers. We are proud of our dedicated team and its incredible knowledge of Tanzania and its National Parks, wildlife, beaches, mountains, people, and culture. We actually take you there, providing step-by-step service along the way to ensure a smooth and happy experience. Our local guides have years of knowledge in wildlife management helping to provide a one-of-a-kind experience in the field. We are also partnering with Safari Bookings to help you get the most out of your travels. And while in Tanzania with Visit Tanzania Tours & Safaris, you will be supporting a responsible and sustainable safari that also preserves the beautiful country of Tanzania. When you book a safari with Visit Tanzania Tours & Safaris we will pick you up at your point of arrival in Arusha, northern Tanzania. In most instances your safari guide will meet you on arrival but sometimes you may be met by another representative from Visit Tanzania Tours & Safaris. We can help you book domestic flights, land and see transportation, road transfers or exciting tour excursions for many of Tanzania’s attractions. We do not offer International airline bookings. For safaris on the northern circuit it’s best to arrive at Kilimanjaro International Airport (JRO) located midway between the towns of Moshi and Arusha. Currently this airport is served daily from Europe by KLM and several times weekly by Ethiopian Airlines. Additional airlines such as British, Emirates and others fly into Dar es Salaam (DAR). At Visit Tanzania Tours & Safaris we make it easy to have custom itinerary tailor made safaris that fits the interests of the customer. The transportation of all our tours and safaris is included in the package price. The safari guide and 4WD vehicles we provide are for the your personal and exclusive use. Private safaris can be arranged for 2 passengers, and even 1 passenger. Group safaris are popular as they tend to save money while seeing more territory. Let us know if we can help you arrange a private or group safari tour. Both experiences are rewarding, choosing the one that best fits your needs can be discussed beforehand. Please contact us for more information. There will be a cook to prepare your food and the guide will assist in erecting the tents. Meals are served like in a lodge and sometimes under the stars or “al fresco”. Both lodges and tented camps employ nighttime guards to assist you to your room or tent after dinner. Camp is set up in designated areas within the national parks or at private facilities nearby. One of the advantages of vacationing with Visit Tanzania Tours & Safaris is the exceptional quality and value for the money that our services provide. We’ll help you plan a vacation to Tanzania whether it’s an individual vacation or a group itinerary. We focus on tailor made safaris that include any itinerary you wish. We have a highly experienced staff who can custom design the usual, or create the special interest tour that fits your tastes. Our ultimate goal is to provide you the best experience for a fair price. Our Company can provide a unique experience that is hard to match. We are experts in what to see, where to stay, and what to do. Should you require any additional information, please do not hesitate to contact us. A visit to Tanzania with us is truly a trip of a lifetime. Tanzania is the home of some of the most beautiful national parks in the world. If you are considering a visit for a holiday or to conduct business in Tanzania and Zanzibar, you will be required to obtain a visa through the Tanzanian Embassy in Washington, D.C. before your departure. Or you can pick one up on entry at Kilimanjaro International Airport, Dar es Salaam International Airport, or at the Namanga border crossing from Kenya. To avoid the inconvenience of sometimes waiting in long lines at the airport, and possibly not receiving the visa in time, we advise our customers to obtain their visa stamp on their passports (the fee is the standard $100 US) before departure at our Visit Tanzania Tours & Safaris offices. We are located at 390 Bel Marin Keys Blvd, Novato, CA and are open Monday through Friday from 9am to 5pm for your convenience. You can reach us at (510) 517-6047. 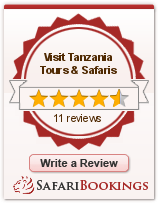 Your guide is the key to a successful Visit Tanzania Tours & Safaris experience. Our dedicated Tanzania tour guides take pride in introducing you to their stunning country. Their knowledge of the game parks and wildlife will make your Tanzania tours adventure complete. They don’t miss a beat as they take can you to the well known safari and tour attractions of Tanzania, or the off-the-beaten-path ones as well. Experiences like chimpanzee trekking in the rain forest of Mahale and Gombe to observing a local Masai tribe in their natural habitat are once in a lifetime experiences. Come join us in Tanzania today! To truly capture the photography and wonder of Tanzania, it’s essential to witness it from key vantage points that offer close-up views—and the only way to do that is through exclusive stays in remotely situated camps like ours and from vehicles that take you to the game up front and personal. See more on our gallery page. From classic safari destinations that reveal abundant wildlife, several major game populations, predators on the prowl, migrations, big game views, to boating, climbing, landscapes and chimpanzee tracking, we cover it all. A total of 128 languages are spoken in Tanzania, with Swahili and English being the two official languages and Swahili as the national language. The music, the customs, the clothing and the architecture of Tanzania is vibrant and unique. Take an educational tour and get to know the local culture. Many of our tours of Tanzania include the island paradise of Zanzibar. It’s vibrant beaches, unique culture, music and architecture of the past and present make for a perfect family or adult get-away. Travelers to Zanzibar always take in Stone Town, the vibrant and colorful island capital, a historic hub of commerce and culture. Find out more here. Climbing Mt. Kilimanjaro is a test of one’s abilities and has become a ‘must-do’ for traveler’s. The experience can truly be life changing and we highly recommend it for anyone with even a vague interest in mountaineering. Find out more here. Discover our off-the-beaten-track experiences by taking a Tour Excursion like chimpanzee trekking in the magisterial rain forests of Mahale and Gombe, or observing the local Masai tribe, or game viewing in the remote Selous Game Reserve. Our mission is to offer you a safe, well organized, fun and educational experience. Come join us on a Visit Tanzania Tour or Safari today.